Brussels in December: damp, windy, grey. An hour to kill between the meetings at the Berlaymont and the Thalys at Gare du Midi. Three snapshots taken on the way, each of them with a funny symbolic twist. And each of them accompanied by a good New Year’s wish for the EU. First stop: on the ground floor of the Berlaymont. 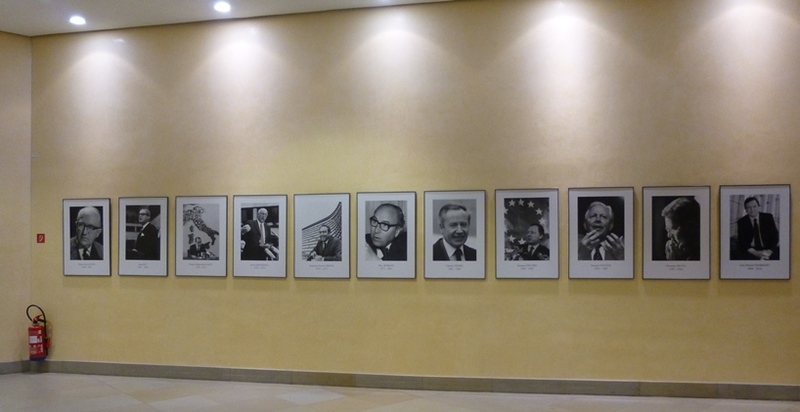 The gallery of Commission presidents, from Hallstein to Barroso. And Juncker? Well, he may not have his portrait yet on this wall, but at least he can use the fire extinguisher in the left corner to douse the flames of indignation at the Lux Leaks revelations. My wish to Jean-Claude Juncker: may 2015 be a year during which he seizes every possible opportunity to extinguish the fires of suspicion, scepticism and distrust! Second stop: in the metro. I’ve been travelling to Brussels for over fifteen years now, in summer, winter, in the sunshine and under pouring rain. If there’s one thing that has never changed, it’s the escalators. 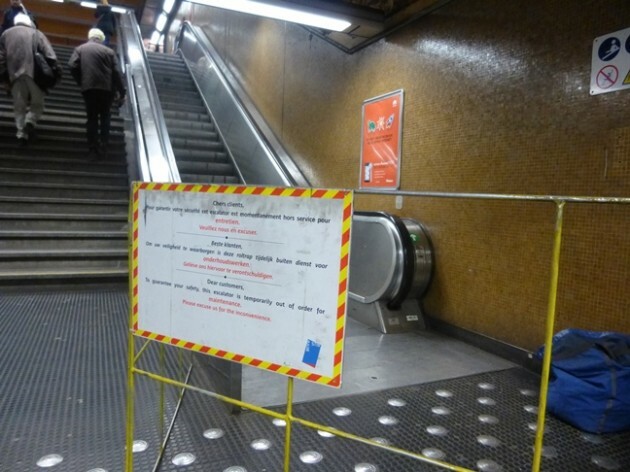 There seems to be an unwritten rule (unless it’s a European directive applicable to the Belgian capital only) stating that a qualified majority of Brussels escalators are to be in repair at any moment of the year. My wish to Brussels: may 2015 be the ‘year of the escalator’, during which thousands of European officials are given a new feeling of ‘upward mobility’ on the way to their offices. The impression that things can actually work may only be beneficial to the functioning of the EU as a whole. Third stop: on Rond-Point Schuman. Right in front of the European institutions a large number of billboards announce an exhibition on the ‘Giants of the Earth’. Come to think of it: isn’t that exactly what Europe once was over several centuries and, let’s face the truth, is no longer? On the other hand: most of the ‘Giants’ on exhibit have not been able to adapt to a changing environment and are now extinct species. My wish to the European Union: may 2015 be a year during which it proves all those wrong who announce that the European mammoth will be dying out soon. May it show that despite its clumsiness and unwieldiness it is perfectly capable of adaptation and fit for survival in a Darwinist environment. No need to be a ‘Giant’: it’s fine to be unpretentious, middle-sized, and … alive. Admittedly, this is not a very serious blogpost to start the new year with. But behind the irony and the funny coincidences, the New Year’s wishes are timely and sincere. Good luck and all the best for 2015! This entry was posted in Current Affairs, The EU and tagged Brussels, European institutions, European Union. Bookmark the permalink.